Do you like your fantasy light and fun instead of dark and portentous? Do you like realistic fiction and school stories as well as magic and spells? If so, you might like the Magic Repair Shop books. Maggie has to live with her grandmother while her scientist parents are doing field research in the Amazon. When she gets there, she lucks her way into a job at a magic shop—a REAL magic shop—and discovers that her late grandfather had been a powerful magician. Whether Maggie is dealing with mean girls at school or solving magical mysteries in the wilds of Scotland, her adventures are always enthralling—and funny! Three books in the series are currently available, and hopefully there will be many more to come. They say you can’t judge a book by the cover, but this title proves conventional wisdom wrong. 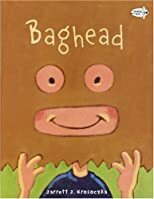 Baghead is a story about a boy with a bright idea. A very big, brown, bag idea. People who encounter the boy with the bag on his head don’t believe he can do the things he‘s setting out to do. However, Josh proves them all wrong. This book has very cute illustrations that make the story come to life. So why is Josh wearing a bag on his head? Only his younger sister is smart enough to ask. And let’s just say his name was not Mario Tricoci. Another winning title by Jarrett Krosoczka. Talk about a timely book on a very important and current subject! The Magic School Bus series is great for helping kids (and grown-ups) understand very big and sometimes complicated topics, and this one is no exception. This book caught my eye because of the subject matter and the sweet polar bears floating away on a little piece of ice on the front cover. Of course, as always Ms. Frizzle takes her class on another very cool adventure to learn more on the subject – this time about global warming, climate change, alternative energy, conserving and recycling – all covered in a fun and inviting way. Even though the jury is still out on some of these issues, this book would be really valuable to teachers and environmentally-conscious parents wanting to talk and learn about some of the issues facing our world. And the great thing is, you could use this for younger kids too (maybe 6 or 7), since Magic School Bus books can be read with or without all of the extra captions and charts. This is a really great resource! Frannie Miller is a spunky little girl who can’t wait to be grown up and have an amazing job. She uses grown up words such as “actually” and “certainly” as often as possible in order to impress on everyone that she is mature beyond her years. She puts together a resume and business cards and assembles important “adult” things, such as glasses missing their lenses, in her dad’s old briefcase. Look out world! Well, look out local radio station, where her class is slated to visit for a field trip on the mayoral Election Day in her city. Frannie’s plan is to wow the DJ, her classmate’s father, while her class is at his radio station and thus secure a job for herself right then and there. She starts off by scattering her business cards and resume on various desks at the station. But, then she finds herself presented with the perfect opportunity to prove that she, too, can answer questions during the “on air” caller segment of the radio program. After all, she thinks she is filling in during what she perceives as an emergency! Needless to say, things don’t go quite as Frannie had planned and more than one disaster takes place. Mem Fox is an amazing picture book author whose titles are always lyrical and fun to read aloud. Her titles span a wide spectrum from the sweet, soothing bedtime stories like Time for Bed to the absurd, like Where is the Green Sheep? 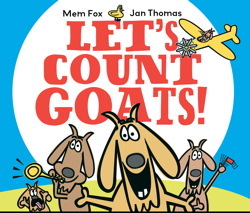 Her latest is Let’s Count Goats and definitely falls in the absurd category. Paired with Jan Thomas’ zany illustrations, this title had me laughing with every turn of the page. Rather than write a story that enumerates each goat, the author asks the reader to count goats in a variety of unlikely circumstances. Every page features goats in silly situations like at the seaside, at the airport “looking for her cases”, “careening round in cars”, and making sand castles. I think that kids will really enjoy pouring over the hilarious illustrations and relish the details such as the funny facial expressions on the goats, the trumpet playing goats with trumpets on top of their heads and backwards in their mouths and, of course, goats chewing on just about anything on the page. If you are looking for a unique way to practice counting, or just a laugh, this book is for you!